LOWER MANHATTAN — A patchwork flag of faded red, white and blue waved briefly in the breeze above the World Trade Center site Friday morning. The FDNY honor guard and nonprofit leaders unfurled the tattered banner, which includes pieces of a flag found near Ground Zero after 9/11, to announce its donation to the National September 11 Memorial & Museum next year. “The flag will tell the story not just of what happened on 9/11, but what happened on 9/12,” said Jeff Parness, current custodian of the flag and founder of the New York Says Thank You Foundation, a nonprofit that sends volunteers to rebuild towns after catastrophes. Recovery workers first spotted what is now known as the National 9/11 Flag at dawn on Sept. 12, 2001, hanging from scaffolding on the heavily damaged 90 West St., unsecured and whipping in the wind. “It became a focus for a lot of us,” said Charles Vitchers, now 51, who was general superintendent for Bovis Lend Lease during the Ground Zero cleanup. Vitchers had to wait until the end of October 2001, when 90 West St. was stabilized, before he could send a crew of workers after the 20-foot-by-30-foot flag. Nearly half of the original fabric was gone, and the rest was faded and threadbare. Vitchers put the shreds in a black plastic bag in his shed, intending to organize a flag retirement ceremony. But the flag sat untouched for seven years, until Vitchers met Parness, who was looking for a 9/11 artifact to take on a New York Says Thank You rebuilding trip to Greensburg, Kansas, in 2008, following the town’s devastation by a tornado the year before. Vitchers gave the flag’s remains to Parness, who brought it to Greensburg’s senior citizens’ center. While Parness and his fellow volunteers built Greensburg a new 14,000-square-foot barn, women at the senior center took nine flags recovered from their town and used them to reinforce the damaged flag from New York. Parness, an Upper West Side resident, is about to launch a yearlong 50-state tour with the flag. At each stop, the foundation will hold a stitching ceremony, where veterans and first responders will add pieces of retired local flags to bolster the original. 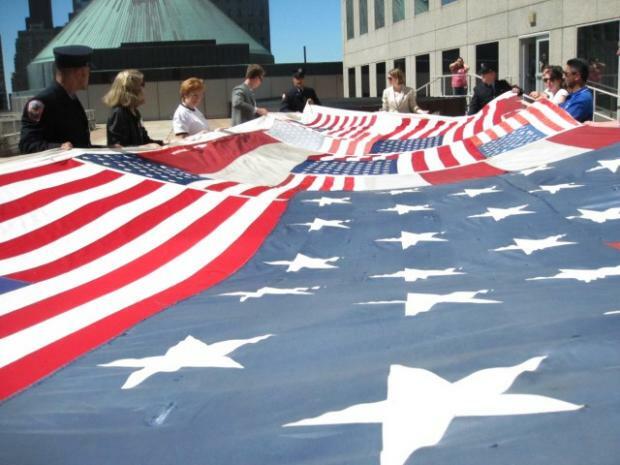 At the end of the tour, Parness, 44, will donate the remade flag to the 9/11 museum, where it will be on display.